SombreEthyl: “Hmm, that’s pretty good. Although it doesn’t quite stir the loins like the home kit, which still has me in its thrall and makes me coo every time I see it, this is a rather decent design and a good addition to Umbro’s City kit pantheon. Back to black then… I’ve always preferred all white as a first choice change kit, but when you’re replacing kits every season then it’s good to mix it up a bit, and I like the idea of a white-black-sky blue away kit rotation. Besides, a black away kit pretty much necessitates a third kit, so there is still room for all white yet! As an unabashed kit nerd I’ll never complain about having a third kit, I’ve never bought into the idea that a third kit is a rip off, that a fan is somehow compelled to buy all three kits. You aren’t, and I’ve no time for third kit based faux-outrage . As far as all-black goes, the 2003/04 away kit was a bit of a game changer; the sight of Ian Ashbee, clad in a mean looking black kit with amber trim, his face flushed and arms pumping in triumph after scoring the goal against Yeovil that sealed a promotion 18 years overdue, that look signalled all-black as an accepted alternative for a change kit. It’s true that a black kit isn’t veering very far from our regular look, but there is something pleasing about being able to avoid a clash while still wearing our club colours, just with the order reversed. If you can’t wear amber and black on your travels, then wear black and amber! 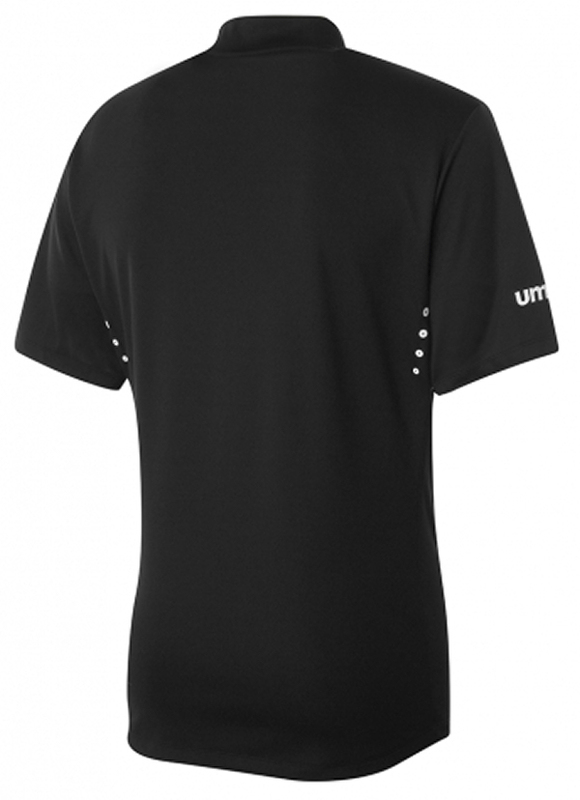 Although quite a simple design, the shirt has a rather interesting neckline that is both crew neck and V-neck, exposing a round amber underpiece that creates the impression that a black top is being worn over the home shirt. It’s a collar style used on the home and away shirts Umbro have made for French club Nantes this year, but thankfully it isn’t on any other English club’s shirts (at least as far as I’ve seen) so it doesn’t look so generic and templatey, that might be the biggest plus of going with Umbro; we won’t be sharing kit design with a glut of other Premier League clubs. I’ve made my feelings about the revised club crest clear on the home shirt review; the crest itself isn’t ugly, but the underlying reason for the change doesn’t sit right with me. Still, I’ve liked shirts carrying a crest I don’t like before (such as the 1999/00 home and away shirts) so I won’t make out that the crest sullies the shirt, I’d just rather our shirts carry the club name. 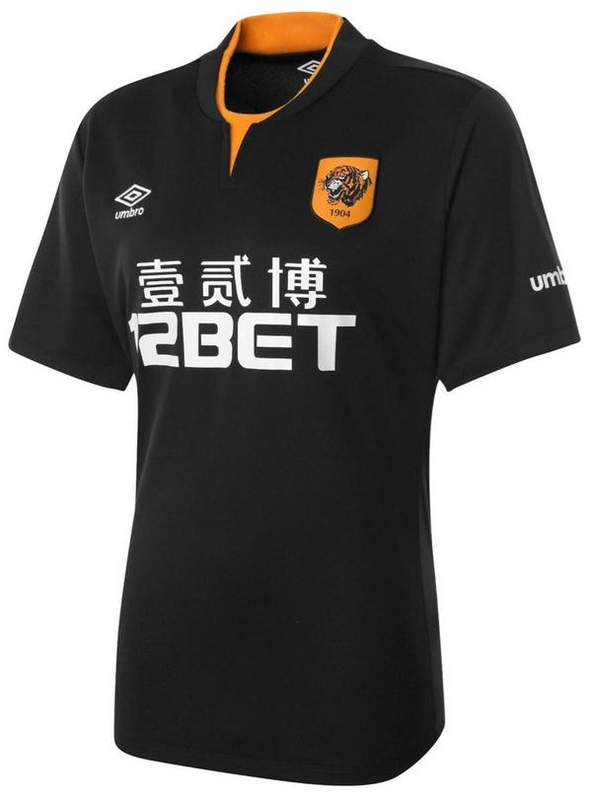 I would also have preferred for the Umbro marks on the chest and sleeves (and while I’m at it, those sleeve wordmarks are wholly redundant and unneeded) to have been applied in amber, because once you add the mostly white Premier League sleeve patches and white numbers and letters, the amount of amber on this shirt will be quite diluted. Similarly, the white edging to the ventilation holes on the back should have been amber to maintain the look of a club specific garment. 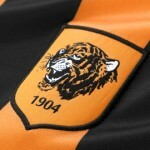 The front of the shirt readily identifies it as part of a Hull City kit, but from behind? Not so much. 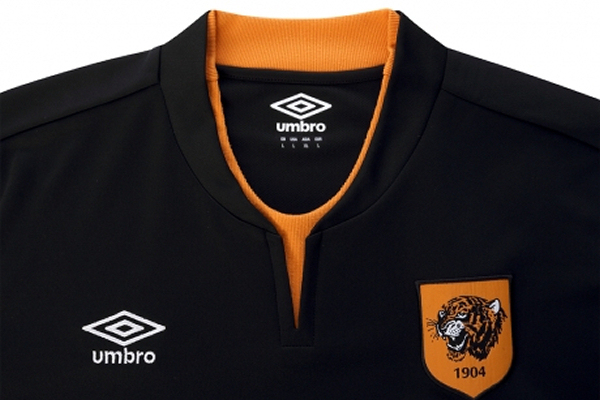 Just a tiny bit of amber on the back would have made a big difference, HULL CITY AFC stitched underneath the collar piece for example, would have really enhanced the shirt. The sponsor looks a lot bigger on this shirt than on the home version, but again I quite like the Chinese text part of 12BET’s logo so that’s not an issue. I like that the home shorts are reused for the away kit, it creates a uniformed look across the sets, and having socks that are a chromatic reversal of the home kit’s hose offers the flexibility to use home or away shirts and socks interchangeability should the need arise. I wonder if there are amber alternate shorts to further increase mash-up options, I quite liked the varied amber shorts adidas created so we could still wear the home shirt if the home team wore dark shorts. Verdict: Not the most practical, but a smart away design nonetheless. I’d have liked a wee bit more amber contrast trim on the shirt, but overall this is a fine away kit and another classy design from Umbro, I’m pleased they are showing signs of a strong recovery after their cruel gutting by former owners Nike. If the home kit is A- then I’d give the away set a mark of B+. JGHull: So that’s new away kit is it? It’s ‘alright’. I know it goes against the initial Twitter reaction (I saw one tweet describe it as ‘beautiful’ – really?) as well as the reaction of SombreEthyl, but I’m a bit ‘meh’. Perhaps that’s because I’ve seen it already – most of us on social media saw the leak and you could see enough of it in that leak to make today’s announcement a bit of a non-event. That’s a shame as I wonder if my reaction would have been different if I’d not seen it. We’ll never know. Let’s be clear – I don’t dislike it. It’s clean, uses our correct club colours and whilst I too would prefer us in an all white get up when we can’t wear our home kit, I agree with SombreEthyl that black kits have their place in our wardrobe. I also agree with his suggestion that pairing it with amber shorts could create a smart looking option. However, I just don’t get the over the top excitement surrounding it. Even Tom Huddlestone couldn’t hide his excitement stating in the press release that “the lads are buzzing with the new away kit” and that they “could feel the quality”. Tom, did you really say that? Heh. Maybe the inevitable third kit will be all white? And whilst City in blue is good too (the Argentina blue kit from adidas looked great), I wouldn’t want the blue and red experiment of last year to be repeated. I think my major problem with it is that it reminds me of the training wear, which frankly I think is a bit iffy. Go look at it on TigerLeisure.com – it’s not great is it? No detailing, no design, just plain black stuff with the Umbro logo and that badge (I too am going to leave the badge out of it this time). If you’re looking for adventure, you can have it in plain purple. I know this sounds harsh but take the badge off and it looks like the cheaper stuff near the door in Sports Soccer. Am I being mean? Perhaps, but it’s not the snazzy Climacool gear that adidas provided us with in the last few years and it’s certainly not a good look for “wor Steve” as he prowls the touchline. Let’s face some facts though – whilst kit geeks like us will pore over the details of our new fabric, it’s the moments that occur whilst wearing it that make a kit a classic. Ian Ashbee punching the air at Yeovil. City at Watford in a play-off semi. City at Wembley for the play-off final. Great City kits need great City moments. Maybe this kit gets its moment in Europe? Fingers crossed. Verdict: Smart enough alternative to a great home kit, impact dulled by a leak and ‘matching’ training wear. There’s just the third kit to be unveiled now, when it is we’ll let you know what we think. Now it’s your turn. Are you happy to be back to black? Give us your thoughts. Is it me, or have the club reduced the gap between 1 and 904? I hope so, that is just so annoying.